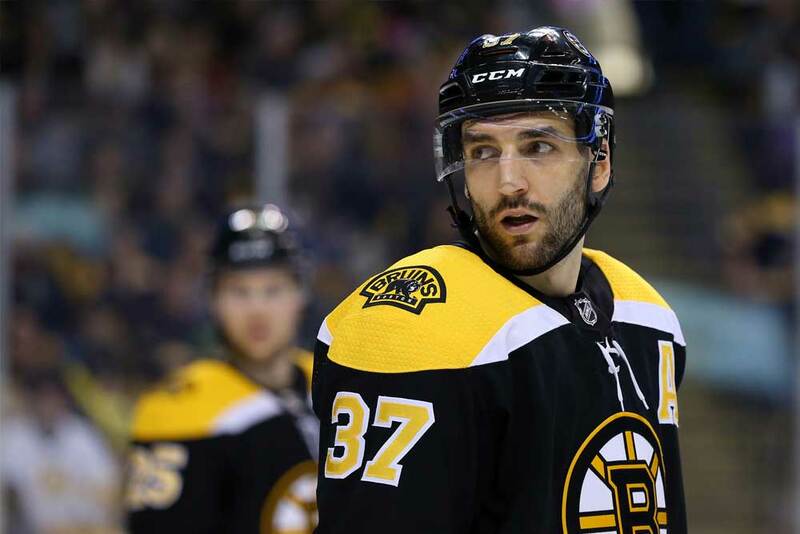 Boston Bruins center Patrice Bergeron suffered a rib and sternoclavicular injury against the Dallas Stars on Nov. 16. The team will re-evaluate him in four weeks. This is truly awful timing for the club since it’s already without the services of key blueliners Zdeno Chara and Brandon Carlo. As a result, the Bruins will find their depth tested even further in the coming weeks. Entering Wednesday’s action, they hold the second wild-card spot in the Eastern Conference. Flanked by Brad Marchand and David Pastrnak, Bergeron has centered one of the best lines in the NHL over the past three seasons. He is currently tied for seventh in league scoring with 26 points in 19 games. With that said, Boston may feel his absence most significantly on defense. The two-way stalwart is a perennial Selke Trophy front-runner (four-time winner) and arguably the team’s defensive conscience. Through sound positioning, terrific stick work and a tireless work ethic, he can match up with virtually any player in the world, which obviously makes life easier for everyone else on the roster. His three-zone impact is nearly unparalleled in the NHL. According to Corsica, the Bruins control 55.8% of shot attempts and 57.7% of goals scored when Bergeron’s on the ice at 5-on-5 — and he does this while facing the stiffest competition on the team. Oh, and he wins 55.7% of his faceoffs. That’s always nice. For most defensive forwards, any offensive production on top of that would just be gravy. Over the past three seasons, though, Bergeron has tallied 142 points in 162 games. Moreover, his high-slot one-timer threat is crucial on the power play and he fares quite well on the penalty kill. In essence, he will be sorely missed in all phases of the game. With Bergeron out, David Krejci will likely enjoy more responsibility. The 32-year-old has played the role of top-line center before and produced quite well over the course of his career (586 points in 789 games). He’s sitting on 16 points through 20 games in 2018-19. Meanwhile, Joakim Nordstrom, Sean Kuraly and youngster Jakob Forsbacka Karlsson will be counted on to provide quality minutes down the middle. Veteran power forward David Backes, who mostly played center during his time with St. Louis, could step in if required. Colby Cave, who leads the Bruins’ AHL affiliate in scoring, was also called up on Tuesday. Seeing as Boston now doesn’t boast an experienced full-time pivot beyond Krejci, the team may struggle to perform without Bergeron’s steadying presence and consistent output.